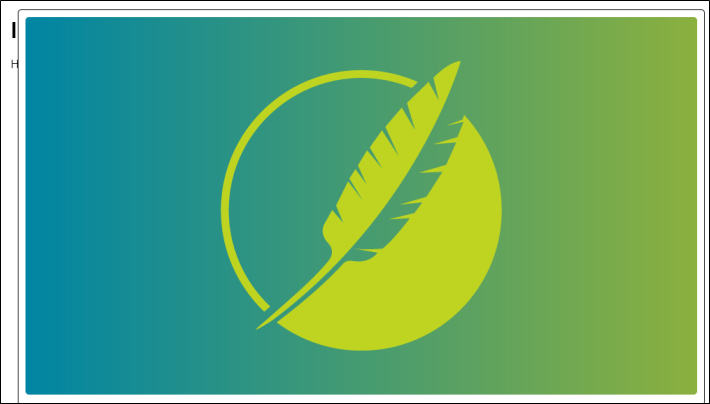 When you insert images into Flare content, you can specify that the images should be displayed as thumbnails (i.e., much smaller versions of the image) in the output. This is a way to condense topics so that images are not taking up as much real estate. When you use this feature, you can specify ways that the user can enlarge the image to see its full size (e.g., by hovering over the thumbnail, by clicking the thumbnail). This can be done through styles or by using local formatting. Using styles is usually recommended because the setting is automatically applied to any content using that style throughout the project, whereas local formatting affects only the particular content that you are working on. Suppose that, in the output, you want the end user to see this image as a small thumbnail. Furthermore, if the end user hovers over the image, it will be shown at its full size. First, you must decide if you want the thumbnail settings to be applied to this image only, or to many images like it throughout your project. Let's say that you have many images and want to apply the settings to all of them. 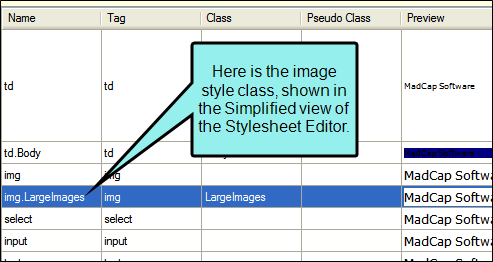 To begin, you might create a class of the img style in your stylesheet, perhaps calling it "LargeImages." After double-clicking this style class, you can set the properties on the Thumbnail tab of the Properties dialog. Next, you right-click on the image in the topic and apply the new image style class to it. 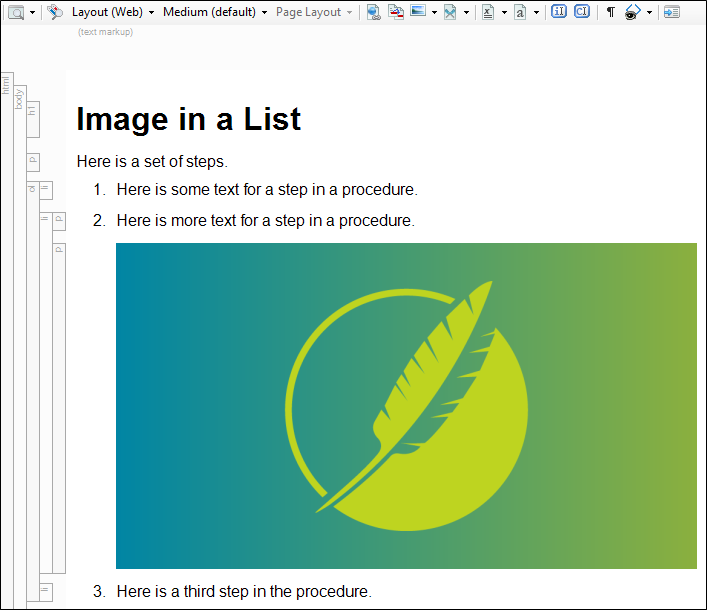 In the local toolbar, make sure the first button displays (which means that the Simplified view is currently shown in the editor). If the button displays instead, then click it. Select the appropriate image (img) style. Let's say that you are creating a WebHelp system that contains small images (e.g., less than 48 pixels high) as well as bigger images (e.g., larger than 48 pixels high). Suppose you want all of the bigger images to appear as thumbnails in the output. In that case, you might create a class of the img style and name it "BigImages." 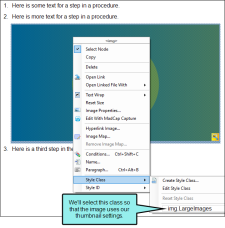 For the smaller images, you can use the parent img style (or even a style class), but for the larger ones, you can use the img.BigImages style class. 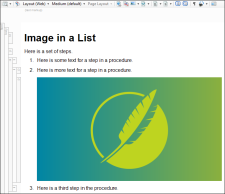 The large images will automatically be displayed as thumbnails in the output, until the end user performs an action to see the image in its full size. In the local toolbar of the editor, click . The Properties dialog opens. In the area on the left, select one of the options. Mouse Over The end user can see the image in its full size by hovering the mouse over the thumbnail. As a result, the full size of the image will be shown in a popup window. Hyperlink The end user can see the image in its full size by clicking the thumbnail. As a result, the full size of the image will be shown. Popup The end user can see the image in its full size by clicking the thumbnail. As a result, the full size of the image will be shown in a popup window. Note: If you select None, the image will not be shown as a thumbnail. If you select Inherit, the image will use whatever thumbnail settings are applied to the parent <img> tag. 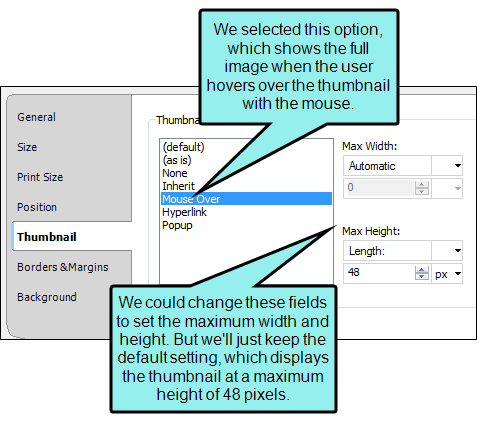 If you want to set a maximum width or height for thumbnail images, complete the Max Width or Max Height fields. You probably only need to complete one of these areas. The default setting is to show images as thumbnails if they are more than 48 pixels high. If that is the case, the image will be resized in the output to be 48 pixels high, and the width will be adjusted accordingly. 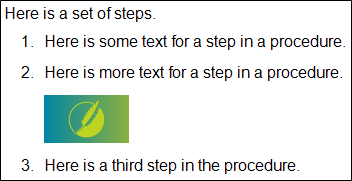 The image will be shown in its full size when the user performs one of the actions you specified in the previous step. If you want to change either the maximum width or height settings, first click in the upper-right drop-down and select Length. Enter a number in the field and use the down arrow in the lower-right corner to select a unit of measurement. See About Units of Measurement. Select the appropriate image style. For example, you can select the parent img tag, or you can expand the img style select a class that you may have created. If you are using the group view, expand the Thumbnail group. inherit This will use the thumbnail setting of the parent tag. hover The end user can see the image in its full size by hovering the mouse over the thumbnail. As a result, the full size of the image will be shown in a popup window. link The end user can see the image in its full size by clicking the thumbnail. As a result, the full size of the image will be shown. Note: If you enter none, the image will not be shown as a thumbnail. If you enter normal, the image will be replaced with its thumbnail. If you want to set a maximum height or width for thumbnail images, click to the right of mc-thumbnail-max-height or mc-thumbnail-max-width and complete the fields. You probably only need to complete one of these areas. If you want to change either the maximum width or height settings, click to the right of either field and enter the appropriate width or height (e.g., 60px, 1in). Note: For Clean XHTML output, thumbnail images that are set as popups are converted to linked thumbnail images (i.e., the enlarged image opens in a new window instead of in a popup). Note: You can also preview thumbnails (see Previewing Thumbnails) and show images as thumbnails while you are editing (see Showing Images as Thumbnails While Editing). Note: If you experience problems in the output with thumbnail images not opening to the full size, this might be caused by "Mark of the Web" being enabled on the Advanced tab of the Target Editor. You can try disabling Mark of the Web from your target to fix the issue. See Adding Mark of the Web.